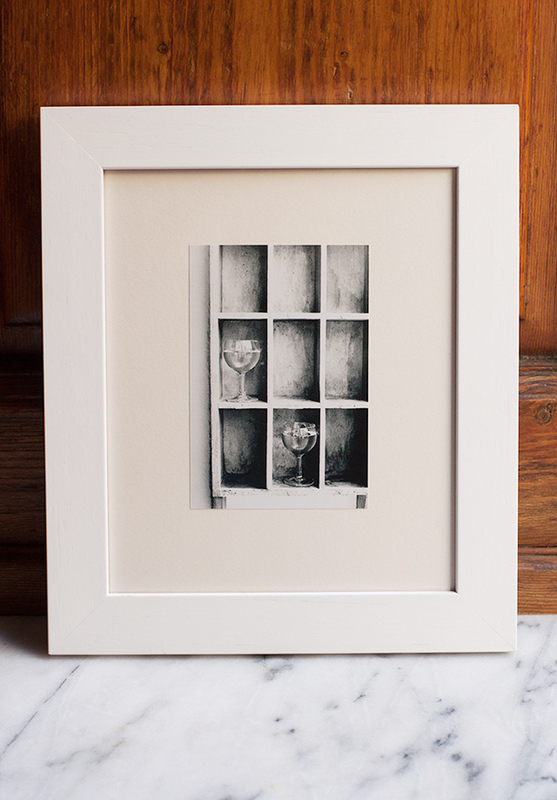 It’s one of my favourite images from the cookbook, a photograph that I took in black and white film of the perfect accessory for a hole-in-the-wall panino spot: a rack for holding your wine glass. This one is at Semel, a wonderful panino place at the Sant’Ambrogio markets. It comes unframed but mounted on museum-quality archival mat board. It’ll come wrapped in marbled paper and I’ll send it anywhere in the world. Just leave a comment below to say who you’d bake this cake for (or want to share it with) and I’ll pick a winner. Get your entries in by 22 May, 2016! 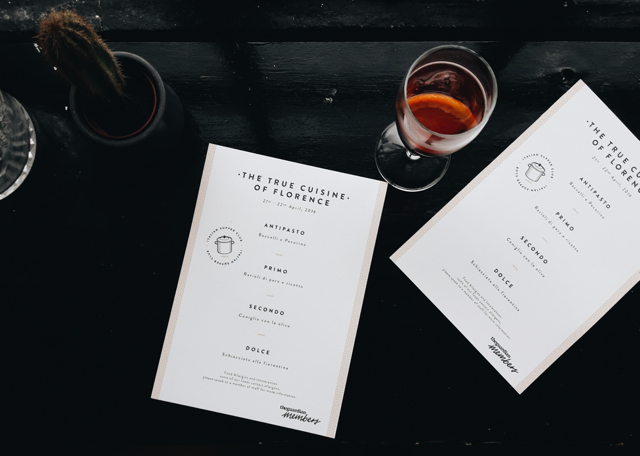 If you’re coming to Florence in May-July this year, and would like to say hello, keep a look out on the events page for more things coming up to celebrate all things Florentine – aperitivo at the back of a butcher shop, a cooking and wine pairing class, a trattoria dinner collaboration or a food styling workshop with the talented stylist, Deb Kaloper, who I worked with on Florentine, for example. But onto this cake. 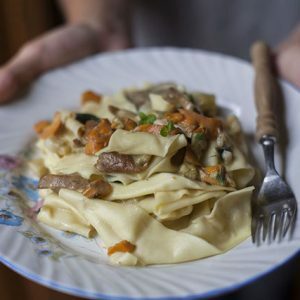 It’s one that I treasure because it is so wonderfully simple and easy to whip up, and I think its homely quality is one of the reasons it’s such a crowd pleaser. It’s one of those cakes that you imagine everyone’s nonna knows how to make and has ready on the kitchen counter when visitors come. It’s one that you will always find, reassuringly, in bakeries, bars and pastry shops all over town. It’s also commonly on trattoria menus for dessert, although many Florentines would even eat this for breakfast or a mid-morning snack. It’s not overly sweet, as Florentines don’t have much of a sweet tooth, and has a good, lemony tang to it, but you could, if you like, brush a little warmed apricot jam over the top once you pull it out of the oven for some shine and an extra touch of sweetness. Place the apple slices in a bowl with the lemon juice and 2 extra tablespoons of sugar. Beat the sugar with the butter until pale and creamy, add the eggs and beat very well until you have a thick, pale mixture. Add the milk and then fold in the flour, baking powder, salt and half the apple slices to combine. 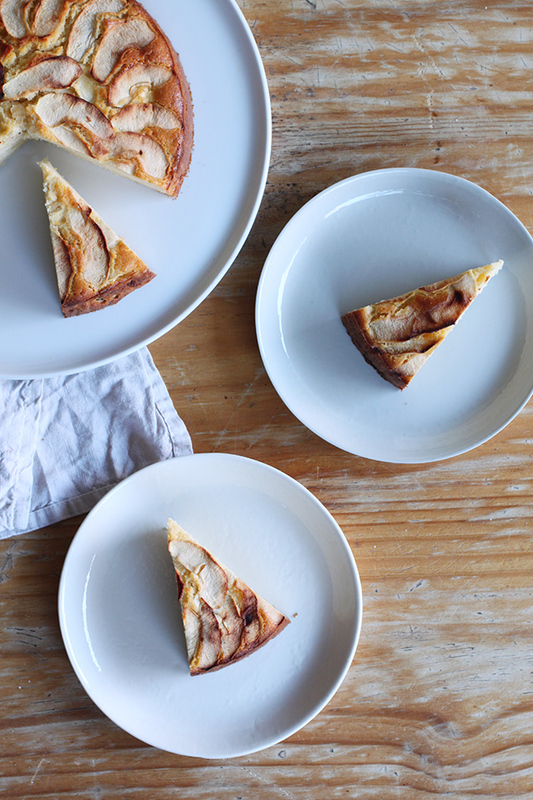 Pour into a cake tin and place the remaining apple slices all over the surface. Bake at 180°C for 60 minutes or until the top is golden brown and springy when touched. 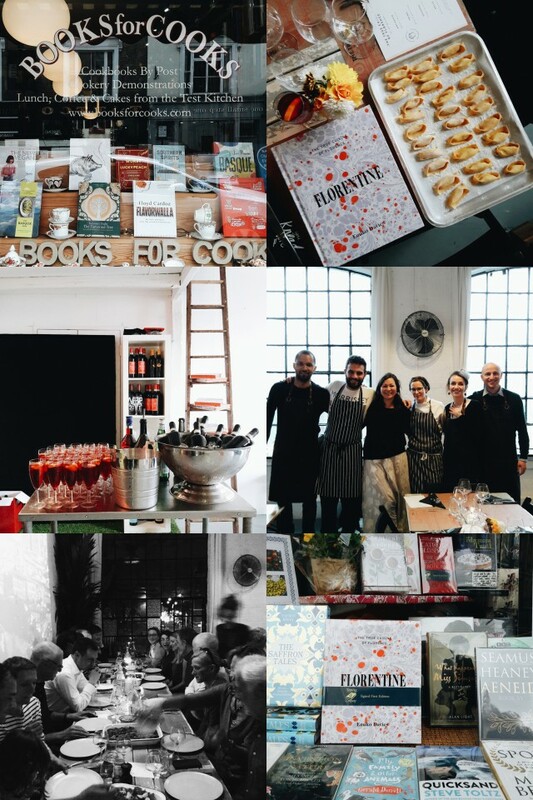 And here are some instagram images and highlights from the Florentine events in the UK I wanted to share — a visit to Books for Cooks, the ultimate cookbook shop in London’s Notting Hill, and the beautiful Toppings & Co bookshop in Bath, where you can find some signed copies; and two pop-up dinners with the absolutely fantastic Italian Supper Club team together with The Guardian in their Hackney warehouse. Good one Emiko, Nico and I are currently on a ‘dolce’ kick (him more than me) and just the tastiest lemon pie known to man so I am totally game to try this apple cake too! Keep up the hard work bella! I would desperately love to cook this for my Nana whom I lost 15 years ago. She taught me to cook and appreciate where my food came sharing stories with me whilst in her veggie garden or under the cool of her giant blood plum tree. One of my all time favourite dishes of hers was her apple pie. She made all the grandchildren their favourite pies for Xmas dinner and apple was always the most popular. Unfortunately we lost her suddenly and hadn’t learnt all her recipes and tricks. Whenever I eat apple desserts I think of her. I’m so sorry for your loss! A grandmother’s cooking is like no one else’s. I hope this would live up to her apple pie! I adore this photograph. 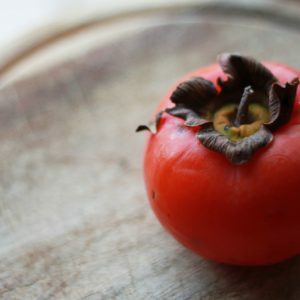 I have an italian zia and zio and they keep me supplied with gorgeous ingredients as little treats through the post. I would love to make this apple cake for my daughter’s sweet sixteenth birthday tomorrow as she loves italian food, culture, and country. I have a small jar of nutmeg sent from my zia in Mussellaro and so I would add a light grating of that over the apples a few minutes before finishing cooking to evoke that wonderful aroma, and to make absent loved ones a part of our celebration. The book looks absolutely wonderful and I can’t wait to try all of the other recipes. What a lovely cake! US Mother’s Day is this weekend, and I am missing my mama, so it is definitely make this for her. I would bake this cake for the Jewish New Year, Rosh Hashanah, for which apples are an iconic image. 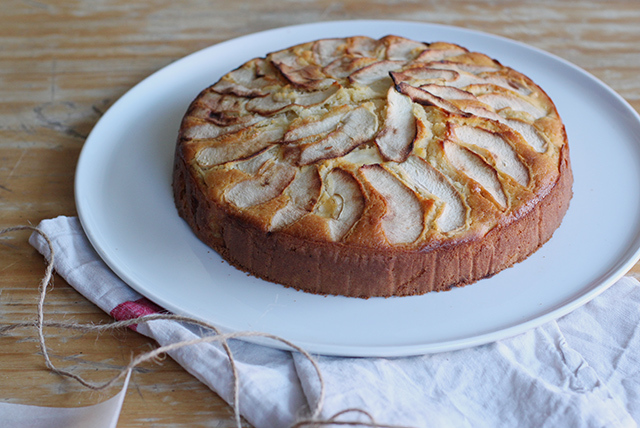 Always looking for a good apple cake to serve at this time! Ooh I didn’t know that about apples! Wonderful! First of all, congrats with the book and all your achievements. Truly, following your life among pots, pans and amazing surroundings is a joy. I will cook this cake for my nonna, who is coming to visit from Denmark this weekend to soak up some sunshine. Un abbraccio from Lago di Como! I’d make it twice! Once for my dinner group – since this month I’m responsible for dessert – and then for my bff’s who are going to Italy with me in June. Maybe you’ll have an event down along the Amalfi coast! Thank you so much! Sounds wonderful — I wish I could say I’m heading to Amalfi Coast too but unfortunately not. 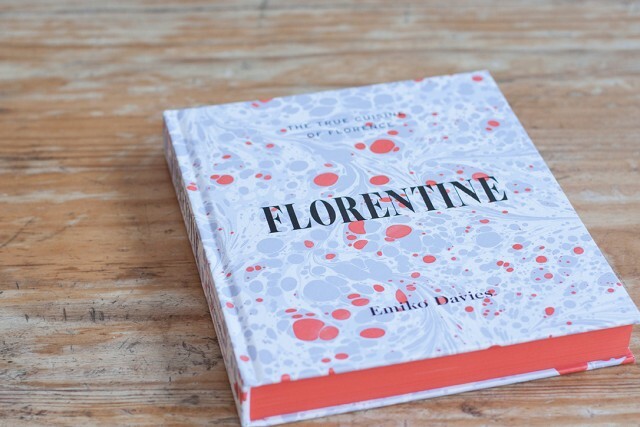 If you come to Florence in June, there’ll be a few events happening then though! I would bake this cake for my mom and our family this mothers day because she does everything for us and deserves to have something nice and apples are her favorite fruit. Hi, just received my copy of your wonderful book last week, have been enjoying reading it. I would bake this cake for my mom, who will be 84 on May 13th. I am planning on taking her to Florence next year for her third visit. Florence has become her favorite spot as it has always been mine. Such a lovely cake, Emiko and I am thoroughly enjoying your beautiful cookbook. I would love to make this cake for my late Zia Giovanna who died last April. She loved cooking and good food and always appreciated a delicious piece of dessert. Apple desserts are one of my favorite things to make. I’m not much of a fan of eating apples as-is, but I adore them baked into a dessert. Continued good luck to you on your book tour and cooking classes. I hope to meet you in person someday when I’m next in Italy. Auguri! I would make this for my nephew… Anything Apple is right down his alley… And he always appreciates it so much – he’s great fun to bake for!!! Is it too selfish to say that I’d make it for myself? I’m pregnant and craving sweets like crazy, and technically always sharing my meals I suppose after I gorged myself, I would give the leftovers to my wonderful, patient boyfriend. Haha of course not! Besides, as you say, you ARE sharing! What a wonderful recipe and gorgeous photo too. My husband and I ate here during our first trip to Florence, fond memories! Hopefully returning soon to show our baby girl the delights Florence and beyond has to offer. Oops I forgot to say who I’d bake this cake for whilst in a sleepless haze looking after my 8 month old baby! I would make this as part of an afternoon tea party I’m hosting for my daughter’s welcome to the world get together! All Italian inspired recipes will be used to celebrate my family heritage! Oh I remember that haze all too well — cake was definitely a nice thing to have around! That’s so wonderful. 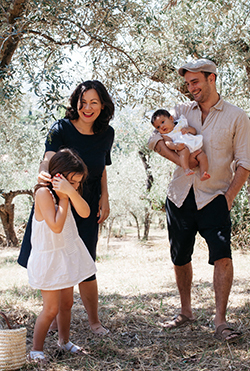 I’m thinking of writing a post about baby-friendly Florence (mostly learned through trial and error!) to help others who want to try to enjoy the city with little ones in tow! Hopefully will get around to it soon! My two dwarf apple trees have just produced their first crop of little apples, so I think I will use them to make this special cake for my Mum for Mother’s Day. We share a love of baking (and of sampling with a cup of tea and a chat!) so she will love this! Thank you for sharing, Emiko! Oh so lucky to have your own apple trees! I would absolutely have to bake this for the kind lady who took me in when I first moved to Florence for my year abroad there. She gave me something very similar when I was really missing home (England) and it was just the perfect match of home and Italy- it suddenly brought the two together. I’d love to share that moment with her again. What a wonderful story! Hope you’re enjoying Florence! I would bake this cake for my wife for our wedding anniversary and share it with our friends. We were married in Florence in the Palazzo Vecchio State Apartments – such a beautiful city and the cake would be a reminder of that perfect time. The picture is stunning too and would look perfect on our kitchen wall! How wonderful – we were married there too, such a memorable and romantic place! Oooh la la! This sounds so insanely delicious. I’m tempted to say I wold bake this for my grandmother on monther’s day this weekend, but I’d be frightened of her reaction to me challenging her famous apple pie recipe. Soooo, to be safe, I’d probably end up baking this with my group of buddies in mind as a massive thank you for all the love (since you can never say thanks enough)! Haha sounds like a good solution! I would love to make this cake for myself!!! And I guess my husband, but I loooove Apple cakes and this looks amazing! I would probably also serve it during rosh hashanah for dessert. It would be the perfect cake for that holiday. I make cakes for myself too, my husband doesn’t like sweets so I have no choice! I’ve so enjoyed following your journey through Instagram. My niece is married to a lovely man from Florence, I have such happy memories of our times shared in this beautiful city. Will make the apple cake for my mum, for Mothers Day, looks delicious and simple, thanks for sharing your recipe. I would bake this cake for my boyfriend, who had been the tree to my loose apples back when I was at the worst stages of anorexia. He was always there for me- rooted by my side- taking care of me unconditionally, supporting me and nursing me back to health. If I hadn’t met him, I might still be suffering right now; if it weren’t for him, I may never have discovered my passion for being in the kitchen, cooking and baking for the people I love. This really touched me – how wonderful that you have someone like that in your life. Thank you for sharing! What a lovely photo, I would la la LOVE to win and frame it. I would bake this cake for my father as I know he would thoroughly enjoy it! This cake would be perfect for a chilly autumn afternoon here in Melbourne, surrounded by my dearest friends, our hands wrapped around giant cups of tea, hearts full of the goodness of being together. This cake looks divine! My mother would love this, since she loves apples. She is definitely the first person who comes to mind when I think of baking this beauty. I recently moved houses and this wonderful old lady who lives nearby always bakes and cooks for me. I would bake this for my adopted Grandma because she loves apples, as a small token of my appreciation! Adopted grandma – I love it! What a wonderful relationship you have! I would bake this for my best friend, Mari! 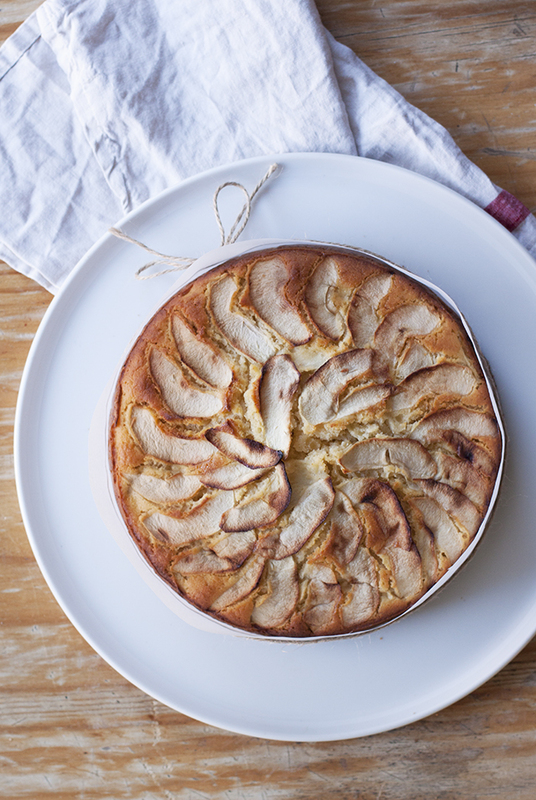 I will be making this beautiful apple cake for my mum this Mother’s Day. She is the most beautiful and inspiring lady. My childhood being surrounded by a large bountiful vegetable garden, chickens, goats and an orchard, from where a myriad of wonderful dishes and dinners would start. Flour covered pastry marble , herb drying racks swinging from various points, the wonderful smells of baking forever present, have made both myself and my two brothers very capable cooks. She will no doubt have a large bowl of goat cream fraiche to dollop on her slice, with a sprinkle of lemon zest and fresh nutmeg. I think I know her well enough that she will not miss out on this. A perfect match with this wonderful cake. :). That sounds heavenly — especially the creme fraiche! I’d bake it for my wife! There is a house of really sweet rock-and-roll-loving boys a couple blocks from me. I suspect they don’t really eat food, at least regularly, and so I get a real kick out of playing mom and taking good things to them to eat. This is just the type of homey treat beer-and-take-out-pizza boys need to have! Sweet or savory, something homemade is always the heart-healthy option. No, but I love her short stories so I will absolutely get that book! (How did I not know she wrote so much about food?!) Thank you for the recommendation! I’m thrilled to check it out :). By the way, I recently made your recipe for cecina and I constantly crave it now! I’ve made it at least once a week for the past three weeks, keeping the leftover batter in the fridge overnight for a day 2 each time. 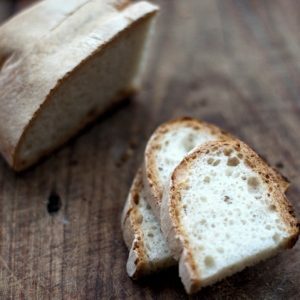 I now understand why cinque e cinques are so popular, because the soft, olive-oily cecine really scream for some good Tuscan bread. (It seemed really “bready” to me before I did it at home.) It looks like I’ll probably be coming to Tuscany (mainly, Siena) in a couple months, so it will be one of the many street snacks on my bucket list! I would bake it for my fiance, as we get married in Tuscany at the end of the month!! I would bake it for my Husband, his birthday happens to be May 22nd and it’s a big one this year. Oh happy birthday to him! Congratulations for your book! Your cake looks delicious and I would like to make it for my mother as it is Mother’s day this weekend in Canada. I would bake this cake for my husband. I love a good apple cake. I was just blogging about your book. I made the cornetti over the weekend-the first thing to try from the book and they are wonderful. Thank you Emiko! Wow, you are a star! The cornetti are probably the trickiest thing in there (which just goes to say — the rest is a breeze!)! Thank you! I would make and share this cake with my 93 yr. old dad as it looks like something he used to make many years ago, but due to his age and failing sigh he doesn’t bake from scratch anymore (only makes brownies from a mix). Oh this is wonderful. I’d cook this for my boyfriend. A native Italian, we met when I was working in Italy. A year on, my Italian has vastly improved, and I hope my cooking (with your help) will too! Cooking and learning Italian went hand in hand for me! By the sounds of it for you too! What a magical recipe, you’re a beautiful person for sharing it. I would bake the cake for me! No one I know loves and appreciates a cake as much as I do, so I would netflix and cake. Haha sounds like a perfect night in! I would bake this cake for my Mum. She left Italy in 1952, engaged to Dad and going to meet him in Australia to start their great adventure together. They both took such a great risk to have a better life and that risk has been rewarded sweetly. This cake would remind her of family, friends and helping her brother run an osteria from the family home. They probably offered something very similar. How wonderful, I love hearing these courageous stories that have a happy ending! I would love to make and share this cake with my lovely Mum who will be 95 this summer. ShE can no longer travel but so enjoys hearing about my Italian journeys with my husband and particularly our fod experiences! I would so love to win this beautiful book. Wow, sounds like your mum definitely deserves a slice! Thank you. I made this cake tonight for my family and myself and love it! I’m sure my kids and husband will love it tomorrow! I would make this lovely cake for my funny & sweet friends. Beautiful recipe! I would bake this cake for my Nonna, who is no longer with us today. She use to always make apple cakes or taralli whenever she knew someone was coming over for a coffee as she always had apples on hand, “an apple a day keeps the doctor away” right! I owe my nonna the world and I am so thankful for having spent so much time with her in the kitchen. I will never forget the days I spent in the summer, helping clean all the vegetables my Nonno had picked from our campania and help her prepare minestrone or any other recipe she had in mind. 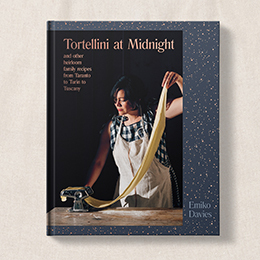 She would always tell me that everyone should have taralli, biscotti or a cake on hand for any unexpected guest,a mid-afternoon treat or simply to brighten up someone’s day. I always looked forward to having her taste the food I made and would wait patiently for her opinion and the best thing she could say is “lo puoi rifare”. I am a new reader to your blog but have followed you on food52. Not sure why I never got here but today I happily, am. What stopped me in my tracks today was the photo of the apple cake. I grew up on them as my mother made them often and then as I got older, I did. Growing up in NJ we had gardens and many fruit trees and the apples were quite special. We didnt realize it at the time but today they would be an heirloom variety. I have never seen them for sale except one time at a farmstand in PA.they made splendid cakes and pies. The trees were rooted from trees at my grandparents farm in NJ. 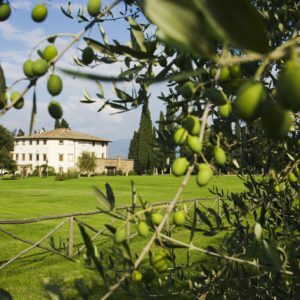 The house on the property was built in about 1750, not old by some Italian properties, but that farm had many old fruit trees. So we always had them around or in storage. If someone stopped by for coffee my mom would whip one of these one layer apple cakes up. Thanks for reminding me about them. Ps love the photo of you making pasta ( with your little girl?). Since my family came from Italy we made it often.